Led by dairy farmer, Sue Harnett, the Burringbar Catchment Group, gathered to ponder a problem; their local produce was being overshadowed by products from the more recognised Byron Bay region. 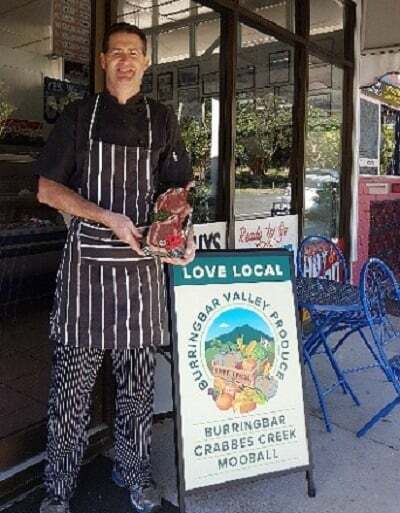 The group, which includes, fruit and vegetable farmers, bush food growers, local retailers, a rainforest nursery and beef and dairy producers wanted to present a united front to bring recognition to their wares and rich farming valley. Sue Harnett, Burringbar Catchment Area (r) and Tina Kelly, Farming Together Consultant, worked to bring the collaborative vision of the group to life. Brett O'Keefe of Burringbar Quality Meats displays his new A Frame and locally sourced Tomahawk steaks supporting the new logo stickers. The Farming Together program initially provided advice from consultants specialising in regional development, agri-tourism and marketing. They helped the group formulate a mini Feasibility Plan for their joint-business ideas, which led to the identification of the first step – the development of a multi-product local brand for the valley. Farming Together supported the group with a marketing expert to develop recognisable branding for the group which would reflect all of the members’ products. The brand had to represent the area and be suitable for placement on locally grown produce and signage. 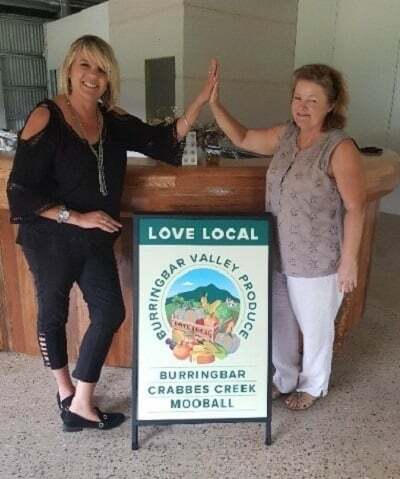 Connecting in with other ‘Love Local’ marketing activity, a logo was created, for use on product stickers and A-Frame signs at Farmers Markets and retail outlets in the three catchment villages of Burringbar, Mooball and Crabbes Creek. The highly visible art work has been touted as success by those it affects most – the farmers. Although too early to determine exact financial benefits, all group members mentioned is growing awareness, and pride in their produce. The large A -Frame signs, displayed in the three local villages have provided a strong reference for locals and tourists alike, who can now identify where local products can be purchased. Locally produced logo. 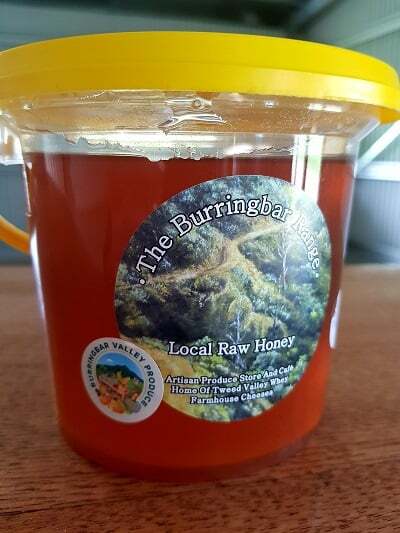 Locally produced honey. Working as a group brought producers, farmers and retailers closer together and instilled a sense of community and business support for the valley. The group hopes to expand their membership and are investigating co-operative formation. They continue to work together, sharing business ideas to increase profitability for all members. The logo artwork has been shared with valley farmers, to enable them to produce their own stickers and promotional materials. Farming Together has provided legal assistance to develop a brand style guide and compliance codes of conduct in relation to the use of the logo.